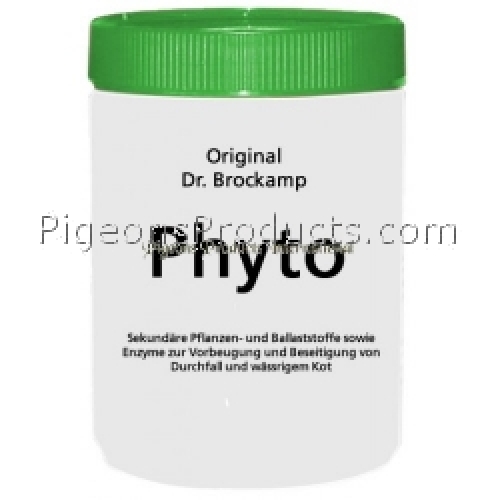 Phyto by Dr. Brockamp fiber-based and natural plant extracts, exceptional regulator in the gastrointestinal tract, for racing pigeons. - Maintains a perfect balance of body fluids. - Using Phyto excrements are achieved and round. - Reduces the symptoms of diarrhea. - In the youngsters have a very beneficial effect, especially considering that the droppings that are around the nest will be solid and dry. - Speed ​​up the recovery process after an intense effort. - During the contest season, the night before shipping at a rate of 5-10 grams of Phyto Probac per kg of feed.